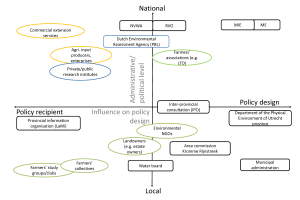 The implementation of the WP1 in the Kromme Rijn area resulted in a thorough understanding of the governance structure and actors involved in the agricultural land use management of the area. The Netherlands is a constitutional monarchy subdivided into twelve provinces. Since the decentralisation, provinces are responsible for environmental, water and infrastructure management as well as economic and agricultural matters. Collaboration among all provinces is facilitated thanks to Interprovinciaal Overleg (IPO). To design policies, they receive support from the Ministry of Infrastructure and the Environment (MIE) and the Ministry of Economic Affairs (ME). To ensure coherence among provinces, the IPO works in close contact with the national parliament, the ministries and the EU. Also the NGO’s, active in Utrecht province, are important stakeholders at provincial level regarding environmental, agricultural and nature issues. Finally, via nationally and locally operating farmers´ associations policy design can be influenced informally. Find here resulting graphs about Actors and Governance.